By Rick Focke, senior product manager for access control hardware, Software House. With the common denominator of IP networks as their backbone, building automation, security and, in particular, access control systems are increasingly coming together, providing both security integrators and building managers opportunities to work in concert on time-, cost-, and problem-saving solutions. Whether integrators have just dipped their toes into the water of adding building automation to their list of services or are fully embracing the convergence of security and building automation systems, the myriad data that these systems put forth, often through a shared protocol such as BACnet or SNMP, make it possible to create not only a safe building, but a smarter and more energy-efficient one as well. The intersection of energy-saving with smart building objectives can often ride on the information supplied by access control data. By knowing the occupancy of a particular building or sector within a structure, captured through entry and/or exit readers, it now becomes possible to implement heating and cooling, lighting, and fresh air ventilation controls based on the number and location of individuals. With heating and cooling systems, the best savings come in seldom-used areas, where the HVAC system can operate in standby mode, rather than being subjected to a particular on-off schedule. While such an operation isn’t recommended for a large-scale heating system – you wouldn’t want to heat up the entire building for just one person coming in on a weekend – it can be advantageous in areas where occupancy minimums are more easily reached. Access control systems can be programmed to control lighting circuits based on occupancy. Once a card is presented to the reader, the system can then begin turning on the appropriate lights based on where that person’s office is located. And unlike motion sensors, which can also be used to control lights, there is no minimum ‘on’ times with a programmed system, so once a person logs out, the lights go off. 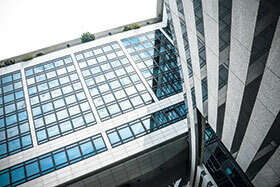 Ventilation is another component of the energy-saving capabilities tied to access control. While the amount of fresh air in a building is governed by building codes, it is usually expressed in the amount of fresh air per minute per person. So, if the number of people in an area can be measured via the access control system, then the amount of fresh air can be adjusted, saving the expense of conditioning that outside air. Deploying access control data can also serve as a planning tool for future building projects, either within the existing structure or when considering expansion or reuse of a property. Having the details on occupancy – who is on site, what hours is the building most used, are there areas that are underused or too crowded? – can become a tool for bottom-line decisions about a company’s real estate expenses. Likewise, such information can be used in day-to-day planning, such as knowing how many people are likely to be at work so security details, parking attendants and cafeteria workers can be scheduled accordingly. And in companies where shared workspace is becoming more prevalent, access data can also help when assigning desks or conference rooms to individuals and groups. Because of the interactive nature of today’s access control systems, employees can receive necessary information through the same system that is logging their comings and goings. Touchscreens have the ability to provide messages, whether they are alerts about an urgent matter, notices about training programmes, or changes in company policy, or just updates on events, such as a companywide meeting. Readers can also become tools for booking rooms, or through the use of a built-in intercom, communicating with security personnel in an emergency. Mobile apps tied to the access control system add yet another layer to building automation by allowing users to remotely unlock doors, receive mobile alerts, and provide two-factor authentication for access to higher security areas. Apps now and into the future will likely get cardholders even more involved with the buildings, allowing them to provide instant feedback and notifications. Additionally, the integration of video enhances both smart building capabilities and security by making alarms visually verifiable, which increases the safety of occupants by better assessing their location and situation. Video can also help reduce false alarms and using video analytics can provide further data on building usage trends. The opportunity within building automation for the traditional security integrator rests in the ability to prepare properly for entering this new realm. Although the technology convergence makes it possible for security personnel to participate, there still needs to be a commitment of time, resources, and planning, especially in the arena of employing IT-savvy staff. Security integrators eager to embrace building automation can often enter the field by taking on projects similar to burgeoning smart home/security projects around energy or lighting. Yet even with multiple crossover opportunities, there may be silos of specialisation for both security and building automation providers that require them to do certain tasks independently while still developing an integrated solution.